How Much Does Storm Shutter Repair Cost? Shutters give homeowners a reliable amount of privacy and security. Their capabilities vary depending on their strength and design, but like all things, storm shutter repair is necessary. While most people think about aesthetics and a bit of privacy when installing shutters, people living in storm-prone areas could consider installing robust shutters to help protect their homes from raging storms. It doesn’t matter how strong your storm shutters are, you will have to run occasional storm shutter repair to uphold their integrity. 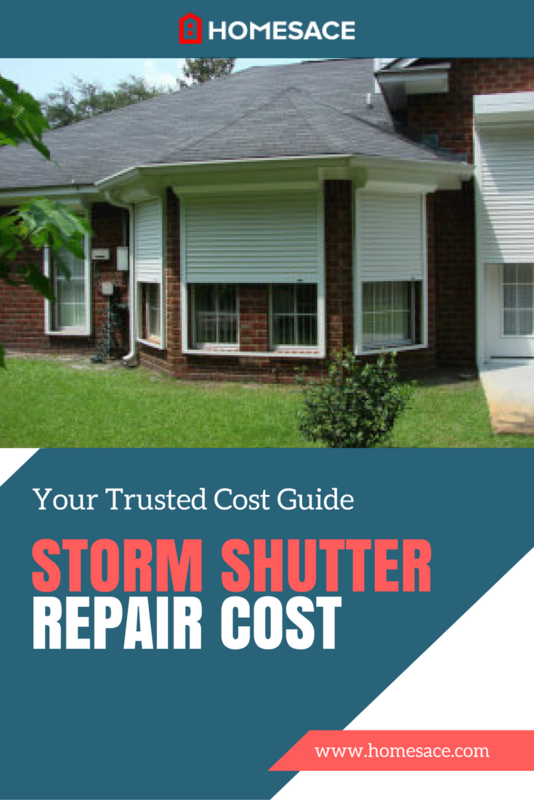 The cost to repair storm shutters will vary depending on a couple of factors. Here are the most important factors to consider and a rough estimate on the cost to handle the repairs. How Much Will It Cost to Repair Storm Shutters? Most of the storm shutter repair jobs will range between $100 to $600 – unless you have huge shutters made of exotic material. Most American homeowners will spend an average of $200 to repair their damaged storm shutters. You should always seek to work with the most experienced storm shutter repair contractor possible. The more experienced the contractor the stronger and good looking your shutters will be long after the repair. Compare estimates from locals for the best rates. Contrary to the popular expectations, storm shutter repair is not always about replacing and remodeling the shutter surface. You might have to replace fixtures like pins, knobs, and springs. Even though these components are cheaper than the shutter material, they will also contribute to the cost to repair storm shutters. The kind of fixture to replace will also determine the labor rates. Replacing loose or faulty hinges might have you purchase a set of cheap hinges. However, since the carpenter will have to go through the pain of uninstalling and installing the storm shutter, you might have to incur a considerable amount in labor. The choice between repairing and refurbishing will depend on your storm shutter’s condition. Refurbishing will involve doing all the necessary repairs and refinishing your shutter. The refinishing could involve sanding the shutters before staining or painting them. This is especially necessary if your storm shutters suffered direct hits during the storm. Keeping your shutters at their best will not only make them more aesthetic but also improve their efficiency. The first step to keeping your storm shutter repair costs low is to prevent damage. Always lock and secure your storm shutters whenever you see a storm approach. They will be more efficient and structurally sound if they face the storm while secured. You should also run regular checks and maintenance runs on your storm shutters. Don’t wait for any damage to be vivid before repairing. Small blemishes could easily spin out of control with every storm your shutters face. Enter your zip code in the space provided on this page to request a 100% FREE storm shutter repair quote. Local contractors in your area are ready to answer your questions. There's absolutely no obligation to hire, purchase, or sign any contracts. It's FREE!